At Elliotts, we know that firefighters today face a broad range of extreme hazards including: high heat and flame, molten materials, hot surfaces, harsh physical environments and possible exposure to chemicals and blood borne pathogens. Elliotts range of protective clothing for firefighters offers protection against the physiological stress created through exposure to these kinds of environments. A unique feature of the Elliott range is that it strikes the balance between offering protection while limiting stress on the wearer. "The main objective for the new X-Series was to create a design that was not only durable and offered high levels of protection but something that fire fighters would want to wear. Ergonomics and freedom of movement were key criteria of our design brief for the new X-Series. The X-Series Coat incorporates articulated elbows, shaped sleeves, underarm gussets, extended length at the rear of the coat, a shorter front and reinforced elbows, sleeve cuffs and shoulders for extra durability. The trousers include contoured articulated knees, reinforced knees and cuffs for extra durability and our new padded harness style braces." stated Anthony Elliott. Structural protective clothing is constructed of multiple layers of materials. Each material has a very specific purpose. Construction must include an Outer Shell, Thermal Liner and can be constructed with or without a moisture barrier. Garments utilising an Outer Shell and Thermal Barrier do not include a Moisture Barrier. The construction type is preferred when penetration by liquids is not a risk and the work environment is very hot and high breathability is a priority. This construction utilises the Outer Shell, Moisture Barrier and Thermal Liner to provide a higher level of protection that is preferred when penetration by liquids is a risk. 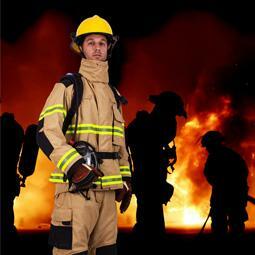 "Elliotts structural firefighting clothing is available with or without a moisture barrier. Our customers require a mixture of both depending on their risk assessments. By manufacturing all of our structural clothing in our own factory in Australia, we can provide our customers with the flexibility to respond quickly to their needs." Anthony Elliott, Managing Director. Elliotts range of Protective Clothing for Structural Firefighters is available in various fabrics and combinations. Nomex and PBI outer shells, Stedair moisture barriers and various thermal liners are standard. "We work closely with leading fabric suppliers from around the world to ensure we offer our customers proven materials and access to the latest in fabric technologies." Anthony Elliott, Managing Director. The Australian based design, construction and structural system features have been created to protect the wearer from the extreme conditions faced by structural firefighters. Our full range of Structural Firefighters Protective Clothing is certified to AS/NZS 4967:2009 Requirements and test methods for protective clothing used for Structural Firefighting.